Two hands after the dinner break, Dan Chalifour has just taken down the Main Event for $63,933. In the final hand, the two players got it all in preflop, Chalifour holding Q♠J♥ against Song's 10♠9♥. The flop came A♣Q♣Q♥ giving Chalifour trip queens. The K♥ on the turn gave Song straight outs, but the 4♣ river was safe for Chalifour to take it down. The final two players are now on a 60 minute dinner break. They will return to play level 29 with 30,000/60,000 blinds and a 10,000 ante. Dan Chalifour raises to 150,000, and Stephen Song makes it 450,000. Chalifour calls. The flop comes K♠4♦3♦, and both players check. The turn is the 7♦. Song leads for 600,000, and Chalifour quickly shoves all in. Song laughs softly and mucks his cards. "I had the flush," Chalifour says. "Here, you want to see one?" he asks as he shows the 5♦, "Straight flush draw." "I had to check to see if I had the ace of diamonds," Song says, "I knew it was red." "I was gonna make you pay for it," Chalifour responds. As the dealer starts shuffling the cards for the next hand Song says, "I should have just checked." Dan Chalifour raises to 150,000 on the button, and Stephen Song shoves all in from the small blind. Ernie Hou quickly shoves all in for less in the big blind, and Chalifour opts to told. The flop comes Q♥6♦4♥ giving Song a set of fours. The 7♦ turn maintains Song's lead, but also gives Hou a flush draw. Unfortunately for Hou, the 2♣ river does not improve his hand, and he is eliminated in 3rd place. The final three players are now on an extended 25 minute "snack break". They will return to play Level 27, with 20,000/40,000 blinds and a 5,000 ante. The average chip stack upon return from the break will be 1,690,000. 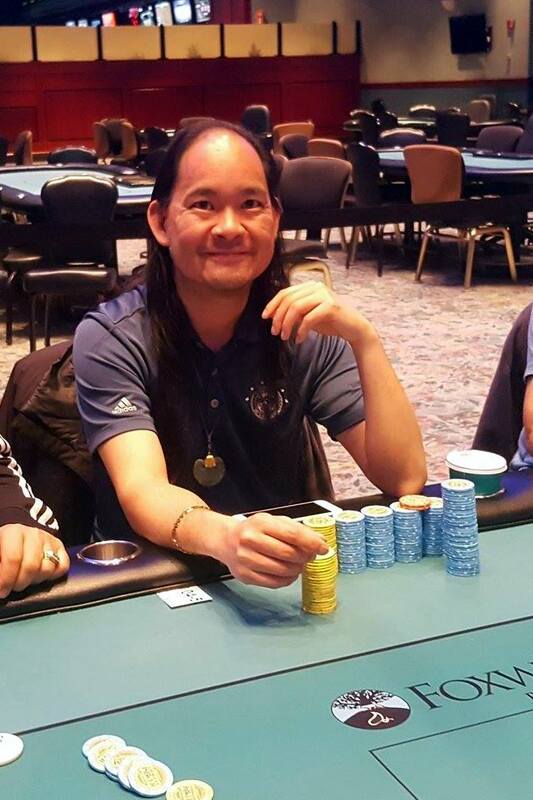 Stephen Song moves all in from under the gun. 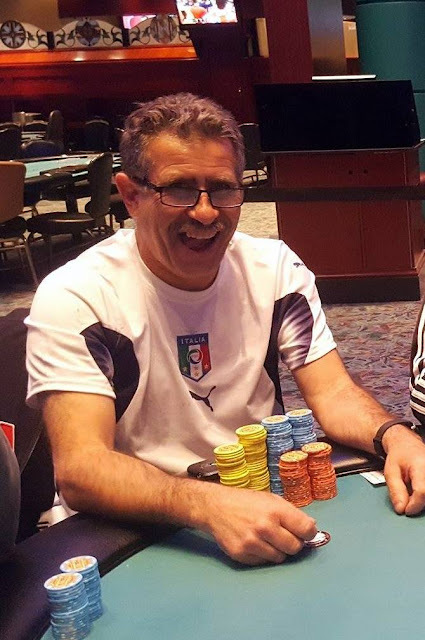 Guiseppe Ruvolo looks at one card and says, "Ya know what, God Bless," and moves his chips forward to call (for less, 375,000). The blinds both fold, and the two players table their hands. Ruvolo says, "I only looked at one," as he slowly tables first the A♦, and then the 9♣. "Oh oh," Song says as he tables A♣5♦. The flop comes 7♠6♠5♥ giving Song the lead with a pair of fives. The turn is the 2♦, and Ruvolo says, "Eight or nine." But it's the A♠ that arrives on the river giving Song two pair to win the hand and eliminate Ruvolo in 4th place. Facing a raise from Dan Chalifour in the cutoff, Stephen Song moves all in on the button. Both blinds fold, and Chalifour calls. "You guys might get your chop," Song says right before the flop comes A♥9♦7♥, giving him two pair. 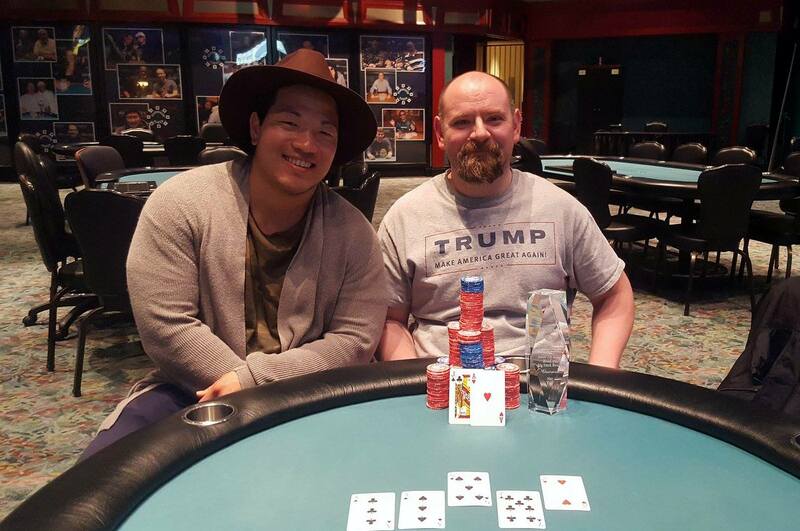 "That's a pretty good flop for me," Song says with a smile. The turn is the J♦. "That's an interesting turn," Song says intrigued. But the river comes the 6♦ to double Song up. The dealer counts down Song's 368,000 stack, and passes the chips over from Chalifour. There were a total of 120 entries in the first flight of the $400 No-Limit Hold'em Multi-Flight Event #8. The field will play down to 15 players before bagging and tagging later tonight. Those 15 players will join any that advance in tonight's Flight B, and any that advance in tomorrow's in Flights C and D. All advancing players will return to play Day 2 on Monday May 15th at 12:00pm. All players that make Day 2 will return in the money, and any player that bags in multiple flights will take home $800 for each additional stack they bag, with only their largest stack advancing to Day 2. Frankie Flowers raises to 75,000 in the cutoff. It folds to Stephen Song in the big blind who announces that he is all in, having Flowers covered, and Flowers snap-calls. The flop comes 8♦7♥4♥, leaving Flowers in the lead with his pair of aces. He mainains that lead when the turn comes the K♥, but Song picks up a flush draw. "Too many outs," Flowers says, and unfortunately for him, the river brings one of those outs, the 9♥ to give Song a flush. "That was dirty," Song says, as the chips are passed across the table to him. The final five players are now on their first 10 minute break of the day. They will return to play Level 25, with 12,000/24,000 blinds and a 4,000 ante. The average chip stack upon return from the break will be 1,014,000. A full list of chip counts will be provided after the break. Dan Chalifour has the current chip lead. 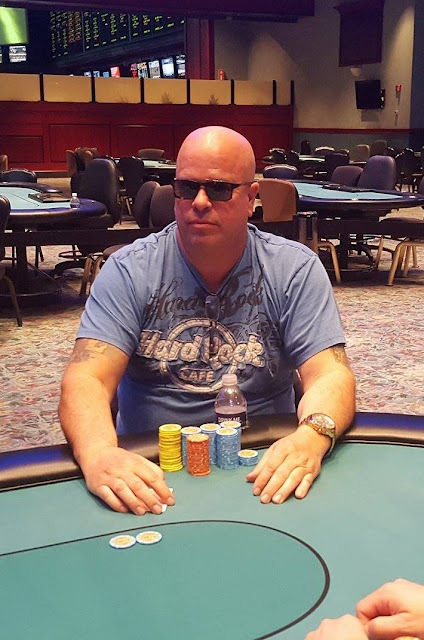 Brian LeBlanc shoves all in from under the gun for around 400,000. It folds to Giuseppe Ruvolo on the button who calls. Both blinds fold, and the two players table their cards. The board runs out 10♦7♦7♠5♠8♦, awarding Ruvolo the pot, and eliminating LeBlanc in 6th place. Action folds to Ernie Hou in the small blind who shoves all in. "How much is it?" Brian LeBlanc asks in the big blind. The dealer starts to count down Hou's 218,000 stack, and LeBlanc calls. The flop comes 8♠7♠7♥, giving Hou trip sevens. "Heart," LeBlanc calls for, but it's the J♠ on the turn, causing LeBlanc to say, "Nice hand." The river is the 8♦, and Hou doubles up. Facing a raise from Stephen Song, Adam Pepper moves all in for his remaining ten big blinds, and Song quickly calls. The board runs out 9♦8♣6♥A♣6♣, awarding Song the pot, and eliminating Pepper in 7th place. After a very early day double for Dan Chalifour (against Stephen Song), the chips have shifted around the table slightly. According to the table, Chalifour had raised with 7-7 and was called by Song. The flop came 8♠2♠2x. Chalifour bet, and Song called. The turn was the 4♥. Chalifour bet, Song raised, and Chalifour called. The river was the 5♠. Chalifour checked, Song shoved all in, and Chalifour called. Song showed K♣9♠, for king high, and Chalifour took down the pot to double up. THIS IS A BEST STACK FORWARD EVENT. Any player to bag chips in more than one flight will receive a payout of $800 for each additional stack, and will carry forward only their largest stack to Day 2. At the end of ten hours of play, just seven of the original 65 Day-2 runners remain. 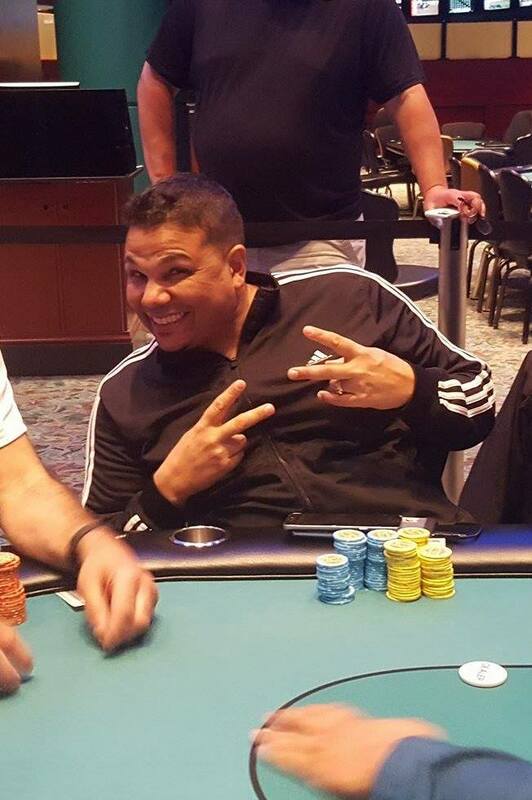 Over the course of the day, many notable players hit the rail. 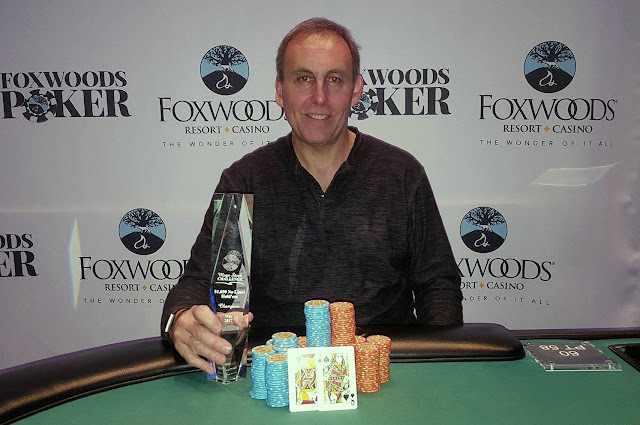 Gerry Aillo, Michael Azzaro, David Stefanski, Ralph Macri, Sam Taylor, Chris Tryba, Michael Clemente, Luke Vrabel, Julie Bae, Brad St. Vincent, Ted Driscoll, Steven Tabb, and Justin Adams all finished shy of the money. 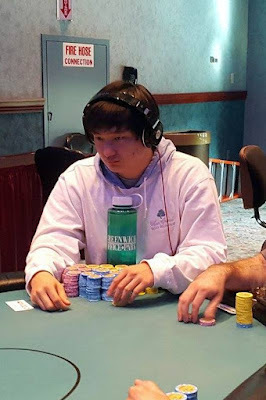 The money bubble burst just after the dinner break when Matthew Wantman was eliminated by LJ Sande. 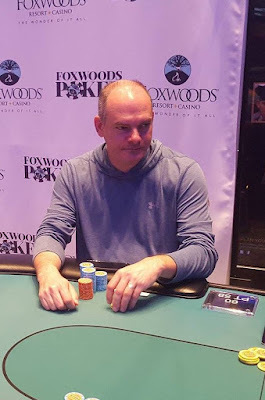 Wantman's A♣K♥ could not improve against Sande's J♠J♣, and he was sent home, leaving the remaining field in the money, and guaranteed at least $3,934. Stephen Song held a monster chip lead for most of the day. He was the first player to cross over the million chip mark, and only relinquished that lead after making it to the final table. But after cracking Ernie Hou's pocket aces when he hit trip queens on the river, and after winning a sizable pot off of Frankie Flowers when he flopped trip twos, he once again, is the lone player over the million chip mark to end Day 2. The start of Day 2 chip leader Guiseppe Ruvolo is coming in second with 950,000, and rounding out the top three is Dan Chalifour, with 879,000. Day 3 play will start at Level 23, with 8,000/16,000 blinds, and a 2,000 ante, and the average chip stack will be 724,285.